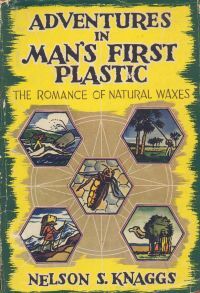 The Romance of Natural Waxes by Nelson S. Knaggs, 1947. "Everyone should have not only one but several hobbies. One of mine is the study of natural fats, oils, and waxes." The carbon paper industry grew by leaps and bounds in the United States until today there are nearly sixty different companies engaged in the manufacture of this highly important product. This is followed by talk of "driving great ocean liners around the world on thimblefuls of atomic power." I would have hoped to have come away with some Amazing Wax Facts with which to bore my friends, but there aren't many. The chapter on bees revealed how little we knew about them until quite recently (like that the queen is female), and their significance in religion ("telling the bees" about deaths in the family is a very old superstition). And I am really no wiser about why a whale has 400 gallons of spermaceti wax in its head.